Today is the day. We’ve sampled the Firecracker apples each day for 10 days, and today they’ve reached their peak. It’s mid October, and the nip in the air translates to extra flavor in many fall-harvested foods. Prime juiciness, peak flavor, a sweetening of bitter elements, crisper texture. That over-the-top flavor in the apples? It’s our taste buds letting us know these are packed with phytonutrients, ready to modify our gene expression toward health and vitality. We tromp through the food forest, wicker baskets in hand, picking our way carefully through the understory of comfrey, yarrow, sage, and and those volunteer vegetables-formerly-known-as-weeds (more about cryptocrops in a future article). Time for a moment of admiration and reflection before the apple picking begins. The carmine red of the apples is played up by the siren of a spirea’s fall leaf color in the background. The dancing of leaves in the gentle breeze, swaying against the backdrop of mountains to the east where the sun has risen earlier. The glorious and unmistakable scent of autumn rising up from the earth. It signifies a shift in, and re-awakening of, the soil microbiome brought on by cooler weather and moister soil. The ornamental shape of the tree, its handsome bark color, its natural height just right, no ladder needed to reach all but one or two apples at the top. We note the bloom—a whitish coating of protective flora on the fruit’s surface—a part of the apple’s immune system and barrier defense. Twisting each gem and lifting gently is enough to easily separate the apples from their knobby fruiting spurs. We divide the apples between two baskets: those near perfect, which will store longer, and those with a peck or bruise or spot, which need our attention today. Firecracker Apples gleaming in the sun at PoSH. Photo by Nicole’s Photo Works. We leave about 10% of the apples on the tree. A gift for the animals who share this landscape with us. The ring-necked pheasant, his loud morning call reminding me to greet my day with similar delight. The wild baby rabbit who nibbles here and there, and seems far too unconcerned by my presence nearby. The deer who camp on winter’s nights in the wind-protected glen and fertilize the lawn. The robins and finches and jays and orioles. I never mind sharing the harvest with them as they work tirelessly eating insects on the trees. On one fallen apple, I find a slug and am delighted. It’s only in the fall or spring rains there’s moisture enough for slugs here. I offer the slick morsel to Gabby, our ancona duck. Her head wobbles in excitement before diving into the snack. Running the ducks in a paddock under the fruit trees is a simple way to manage insect populations. I’m reminded of a quote by permaculture cofounder Bill Mollison: “You don’t have a slug problem, you have a duck deficiency!” I’m grateful for our ducks ability to convert slugs, grasshoppers and other bugs into nutritious and delicious eggs. Now it’s time to settle in the farmhouse kitchen, steaming cups of spiced chai at hand, to process these apples for the coming months, a gift to the future guests of PoSH. There is something very dear about this act of paying forward the gift of nourishment, of loving care lavished on the orchard’s fruits. Of finding oneself within the cycle of planting, tending, harvesting. We don’t all live on a farm or urban homestead, but visiting PoSH, and being part of the cycles of farm life, is a joy. The apples call our attention back to the task. I’ve kept a secret until this moment, and the first apple to be sliced reveals it. Firecracker apples are red inside and out. Not pink: deep red. Red all the way through. 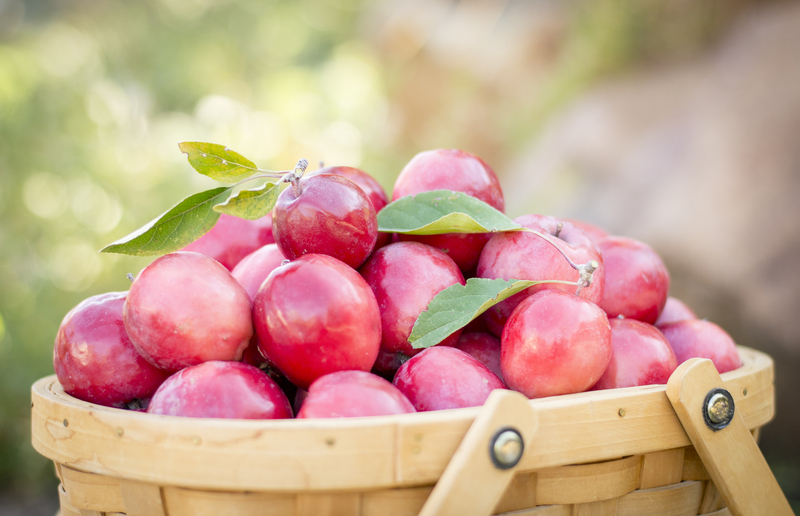 Rich in a wide spectrum antioxidants, anthocyanins, quercetin. Technically a crabapple, but sweeter and larger than normal. They make amazing spiced apples, canned with a bit of apple cider vinegar and sticks of cinnamon. 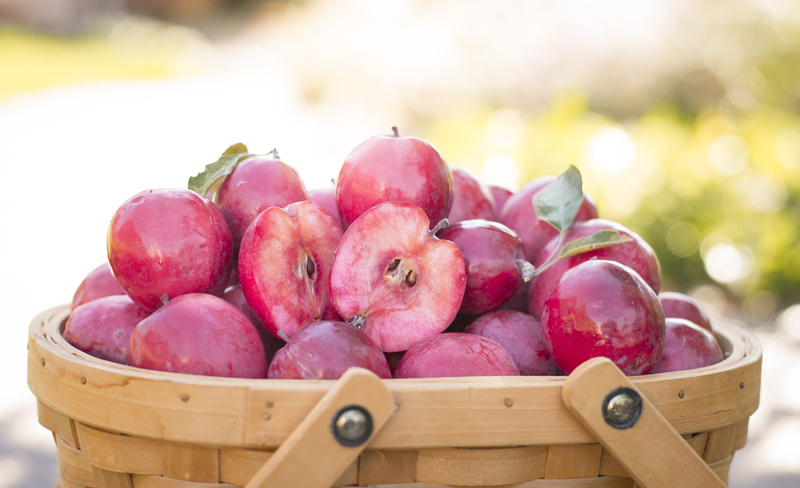 They are wonderful in naturally pink applesauce, no need for sugar. When juicing greens, one small apple lifts the flavor. And they’re delightful, and decidedly different, for dried apples, with their intense “apple” flavor. Drying is the fate of today’s harvest. Even the not-so-perfect apples will join the fun: they each have at least one good side. No need to peel: after all, the majority of the quercetin and other phytonutrients resides within the or just under the skin. We’re exceedingly pleased to see what others might call blemishes! Why? It’s insect pressure and stress in the field that trigger a plant to produce phytonutrients. Phytonutrients help the plant protect itself and, when we consume them, guide the expression of our genes (aka epigenetics). Food plants that are pampered, sprayed, protected from insects? They have very little nutrition! And without those phytonutrients, they have very little flavor too. One year, our nectarine tree had a small infestation of thrips (a small insect oft feared by orchard managers). I guarded the thrips protectively, preventing PoSH’s garden interns from taking action against them. I knew the tree would respond, if given the chance, and manage the thrips by increasing production of phytonutrients. That year the nectarines were unbelievably delicious. It was a fun lesson for the interns, and we’ll all likely remember the flavor of those nectarines for the rest of our lives (yes, they were that amazing). Cutting the apples in half, we use a melon-balling tool to easily scoop out the core. Then slice each half into ¼” half moons. They are dipped into a bowl of water with lemon juice or vitamin C added, antioxidants to retard browning, though hardly necessary, the high antioxidant levels in their red flesh will prevent them from oxidizing. Loading the trays, cut side up, conversation peppers our task: what shall we harvest for dinner tonight, have you ever tried soup for breakfast (it’s my favorite), what foods could you grow at home. 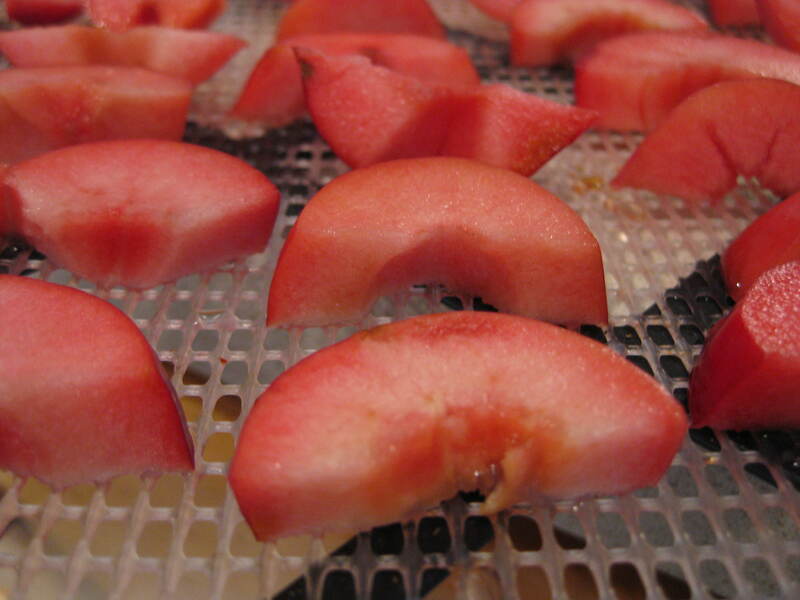 The apples will dry for 6-8 hrs (longer if you live in a humid climate). Tomorrow the guests will be able to sample them, and we’ll pack the rest into air-tight jars and label them. Consider a message, a tidbit of healing wisdom, to share with the guests receiving these dried apples in the weeks to come. Some words of healing wisdom to pass onward. A word, a sentence, an insight. “Remember to breathe in healing and exhale stress.” “Trust yourself and your decisions.” “Find your joy.” The message will be handwritten on the label. We photograph the finished package, apples and label, to place in the PoSH scrapbook. The pantry at PoSH is packed with these little gifts: lavender sprigs dried over the summer. Cubes of spicy basil frozen in olive oil. Frozen milkweed pods pre-steamed and ready to be stuffed and baked. Bags of onion skins, carrot peels and discarded vegetable parts, kept in the freezer, awaiting their starring role in chef Rebecca Katz’s Magic Mineral Broth. Dried golden needles (daylily buds) for stir-fries and mu shoo. Stubby rolls of grape leaves tied with twine ready for dolmas. Cabbage and beets fermenting in a crock on the counter. Blue, teal and cream colored duck eggs nestled in their wire basket calling out for herbed omelets. All the gifts of the edible landscape and the hands that picked and prepared them, suspended in time, awaiting their destiny: nourishing our health. There’s something very healing about receiving these gifts from nature and from each other. Any meal is an invitation to eat mindfully, to remember your connection to nature. Think back through time of the peas growing on the vine just for you, the slate blue Hubbard squash swelling in the field all summer, the intentions of the the people who have gathered the harvest so you can take nature’s gift into your body and transform it into your wellbeing.